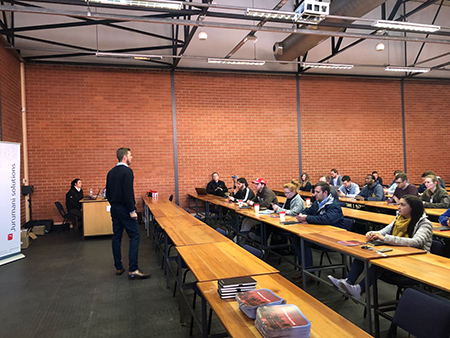 Jurumani Solutions visited the North-West University’s (NWU’s) Faculty of Engineering on 8 August to talk to students about the latest trends in the world of information and communication technology. The reason for the visit was to share ideas on how students can plan their future careers within the technology industry, emphasising what is new, what is trending and which opportunities they can take advantage of. Jurumani, a company that partners with telecommunications companies across Africa, focuses on three main areas - strategy, consulting and outsourcing. This entail helping service providers to accelerate their growth by identifying capabilities and operating models for the future, building products, systems and business delivery capability to enable network operators to better serve their customers, and providing outsourcing services within the service provider environment. “We believe telecommunications is the single most powerful way to reduce inequality and extend economic opportunities to millions of people across the African continent,” said Chrissie Pretorius, a talent acquisition specialist at Jurumani. Chrissie said since they are constantly looking for top talent to join their team, they focus on building and nurturing relationships with possible future candidates. She added that they want to make an impact by providing real advice and detailed information to encourage students to consider pursuing a career in the world of technology. We recognise that the collective skills, experience and attributes of our people define the true value of our organisation,” she said. Jurumani Solutions visited the Faculty of Engineering recently.